Pure Voice read by Rene Auberjonois(John), Theodore Bikel(Leviticus, Psalm, Obadiah, Malachi, Luke), David Birney(First and Second Samuel, Romans, Ephesians, First and Second Thessalonians, Philemon, James), Scott Brick(Isaiah, Matthew, Acts), LeVar Burton(Job, First, Second and Third John), Maxwell Caulfield(Ezekiel), Samantha Eggar(Deuteronomy, Judges, Esther, Song of Solomon, Haggai), Robert Forster(Jonah, First and Second Peter, Jude), Edward Herrmann(Genesis, First and Second Corinthians, Philippians, First and Second Timothy), Gates McFadden(Ruth, Nahum, Zephaniah, Zechariah), John Richard McGonagle(First and Second Kings, Galatians, Colossians, Titus), Juliet Mills(Daniel, Amos, Habakkuk, Hebrews), John Rubinstein(Exodus, First and Second Chronicles, Ezra, Joel, Revelation), Stefan Rudnicki(Joshua, Nehemiah, Ecclesiastes, Hosea, Micah), and Kristoffer Tabori(Numbers, Proverbs, Jeremiah, Lamentations, Mark). 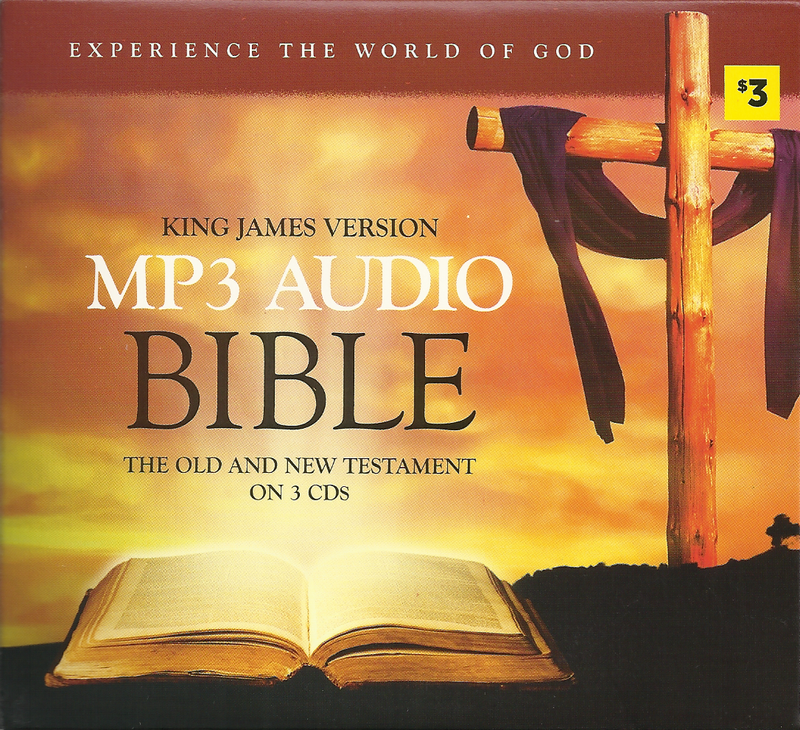 Probably the most popular audio Bible ever. Free. The Jacksons founded Hosanna in 1972 with the goal to share God's Word. Audio cassettes can still be obtained on eBay occasionally. My third favorite. Different voices for different people similar to Zondervan 2002 & 2007. Includes background accompaniment. Occasional artifacts in recording (may have been recorded from cassette tapes). Listen to entire audio Bible online. Sounds like your grandfather is reading the Bible to you. I really like the book of Proverbs in his voice. Former missionary to India. Jon Sherberg reads the old testament and James Earl Jones reads the new testament. Complete Audio Holy Bible - King James Version. CDs published by TOPICS Entertainment, Renton WA (2006). Listen online for free... The recording of the Old and New Testaments were completed in 2011, just in time to celebrate the 400th anniversary of the King James Version of the Bible. WARNING: False advertising alert! This is not pure KJV. It is a variant version. The closest translation I have found that matches is the King James 2000. It falls somewhere between the KJV and NKJV. I bought the New Testament on CD and am disappointed. Read by many different people (YMMV). Extremely rare mp3 CD found on eBay. Free instant download from Intellectual Reserve. WARNING: Includes summary at the beginning of each chapter with private interpretations from the Church of Jesus Christ of Latter-day Saints (commonly called "Mormons"). Published in 2004. Verified same narrator as Resource Ministries cassette tapes. Also known as, "The Spoken New Testament", "The Spoken Old Testament", and "The Voice of Scripture". Audio cassette only. Publisher #1: Chicago, IL : Sound Marketing, Inc., 1982. Publisher #2: Audio Creations, Inc., 1978. Publisher #3: Christian Audio/Visual Corporation, 1977. The New Testament is available in mp3 format. The Old Testament is available in audio cassette only. Read by Dr. C.M. Ward. Publisher: World Bible Sounds (1976). 80 audio cassette tapes. H. M. S. Richards Sr. reads the Bible. Only Psalms and Proverbs are currently available in digital format. Cassettes were published by Hosanna House (Publishing His Praise), Box 1700, Glendale, CA 91209. Audio cassette only. Produced by PRAYER POWER, Inc. PO Box 215, Marshall, MN 56258 For Distribution by Tease Enterprises, Inc. PO Box 633, Faribault, MN 55021 Publisher: Dimension Tapes, Minneapolis, MN (1979). 64 audio cassette tapes. Bruce Bayley Johnson, the unique, distinctive voice of Mayor Jeff on Disney's "P.B. and J. Otter," Mr. Swirly and many others on Disney's "Doug," �Brand Spanking New Doug,� and in �Doug�s First Movie." The voice of Mr. Spudinski, the couch potato on Disney's "Jo Jo's Circus." Commercially, he was the long-time voice of Lever 2000. Brother Domonique is an electrician, but once every week on Friday he heads over to the studio, funded by FWBC, to record the Old Testament of the KJV for the KJVRVG. Audio cassette only(set of 12). Published by Image Media, Inc., 1985. Psalms and Proverbs are also available. To divide Carl Richardson's New Testament book mp3's into chapters, download this zip file with included directions. New Testament audio cassette only. Narrated by Dan Howell. White Wing Cassettes, P.O. Box 1039, Cleveland, TN 37311. 12 audio cassettes. Audio cassette only. Published by Faith Productions, Cleveland, TN (1986). New Testament audio cassette only. Evangelist W. David Baker reads the King James version. 16 audio cassettes. Psalms, Proverbs and Isaiah are also available here. Misidentified as Weina Scott. New Testament audio cassette only. Timeless Treasures (The New Testament on Cassette, KJV) recorded by David Cooper. Published 1978 by David Cooper Corporation, 3035 Directors Row, Suite 202, Memphis TN 38131. 12 audio cassettes.